A 56-year-old female presented with abdominal/pelvic pain and fullness. Her history is significant for a large fibroid uterus treated with a hysterectomy and bilateral salpingo oophorectomy (BSO) approximately 10 years previous. A noncontrast CT scan was ordered and revealed a large lobulated mass filling much of the pelvis and extending into the abdomen. Separate from the large mass were some smaller nodular masses that were initially thought to represent lymphadenopathy. No evidence of omental caking, hepatic metastasis, or ascites was demonstrated. An MRI of the abdomen and pelvis was then performed with and without gadolinium that demonstrated a large, mildly enhancing, predominantly solid mass that fills the pelvis and extends into the lower abdomen. Other separate nodules were again noted and were initially interpreted incorrectly as lymphadenopathy. On T2-weighted imaging, the mass demonstrates decreased signal with a whorled appearance. No ascites or omental caking is present and there is no metastatic disease demonstrated in the liver or osseous structures. The most important entity in the differential diagnosis of disseminated peritoneal leiomyomatosis is peritoneal carcinomatosis, which typically manifests with metastatic disease, weight loss, ascites, and rapid progression of disease. Other differential possibilities include malignant peritoneal mesothelioma, and primary peritoneal serous carcinoma.9 The findings of darker fibrous appearing signal on T2-weighted MRI in a whorled pattern and the lack of ascites or omental caking favors DPL as the most likely diagnosis especially when a patient has a coexisting fibroid uterus or has undergone a hysterectomy for a leiomyomatous uterus. While disseminated leiomyomatosis is a rare entity, it should be considered in a patient with a peritoneal mass or masses, especially if the patient has a coexisting fibroid uterus or has had a hysterectomy for a uterine leiomyoma. The peritoneal masses generally have a darker whorl-like appearance on T2-weighted MRI similar to other smooth muscle tumors and there isusually a lack of ascites and omental caking. 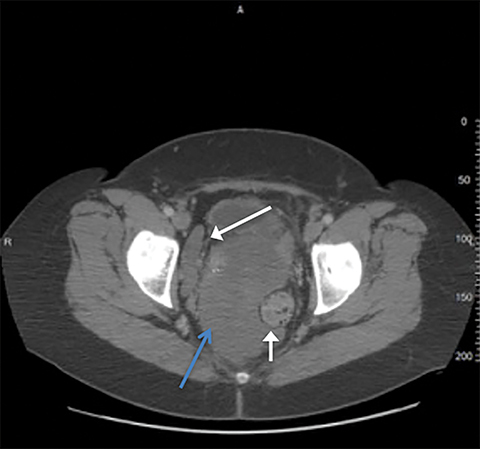 Tanaka YO, Tsunoda H, Sugano M. MR and CT findings of leiomyomatosis peritonealis disseminata with emphasis on assisted reproductive technology as a risk factor. Br J Radiol. 2009;82(975):e44-47. Willson JR, Peale AR. Multiple peritoneal leiomyomas associated with a granulosa-cell tumor of the ovary. Am J Obstet Gynecol. 1952;64(1):204-208. Tavassoli FA, Norris HJ. Peritoneal leiomyomatosis (leiomyomatosis peritonealis disseminata): a clinicopathological study of 20 cases with ultrastructural observations. Int J Gynecol Pathol. 1982;(1):59-74. Fasih N, Shanbhogue A, Macdonald DB, Fraser-Hill MA, et al. Leimyomas beyond the Uterus: Unusual Locations, Rare Manifestations. RadioGraphics. 2008;1931-1948. Kumar S, Sharma JB,Verma D, Gupta P, et al. 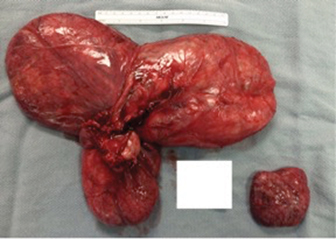 Disseminated peritoneal leiomyomatosis: an unusual complication of laparoscopic myomectomy. Arch Gynecol Obstet. 2008;278(1):93-95. Fulcher AS, Szucs RA. 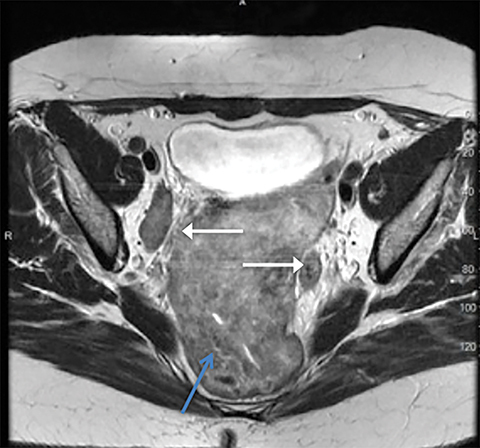 Leiomyomatosis peritonealis disseminate complicated by sarcomatous transformation and ovarian torsion: presentation of two cases and review of the literature. Abdom Imaging. 1998;23:640-644. 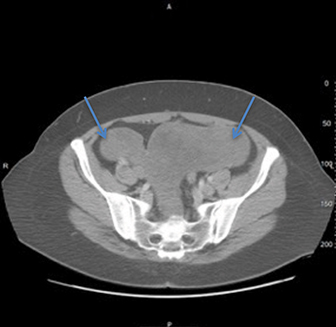 Lausen I, Jensen OJ, Andersen E, Lindahl F. Disseminated peritoneal leiomyomatosis with malignant change, in a male. Virchos Arch A Pathol Anat Histopathol. 1998,417:173-175. Yamaguchi T, Imaumra Y, Yamamoto T, Fukuda M: Leiomyomatosis peritonealis disseminate with malignant change in a man. Pathol Int. 2003;53:179-185. Levy AD, Arna’is J, Shaw JC, Sobin LH. Primary peritoneal tumors: imaging features with pathologic correlation. RadioGraphics. 2008;28:583-586. Gottlieb J, Gottlieb R. Disseminated peritoneal leiomyomatosis. Appl Radiol. 2018;47(1):46-47. Prepared by Mr. Josh Gottlieb while a fourth year medical student at New York Institute of Technology – College of Osteopathic Medicine, Old Westbury, Long Island, NY; and by Dr. Roy Gottlieb while serving as Medical Director at Rolling Oaks Radiology in Thousand Oaks, CA.